I have a plan — it’s more of an observation, really — to improve our designs and save the world at the same time. I’m not entirely kidding. The clue is in the image above, which looks like an ad, but that’s not why it’s here. We were visiting recently with Tim Poole, Before & After’s printer. Dome is a slick, state-of-the-art shop that has won many awards in which design has played an important role. In the course of our chat, Tim lamented what he’s perceived in recent years as a decline in the overall quality of graphic design. “We’re seeing a lot of junk,” he said, not overstating it. That led the conversation to possible causes. The biggest two, we decided, are the Web and the economy. Each has had a different impact. The Web has created an expectation of right now. Nothing waits. Its volume — more than a billion pages — is stupefying. And resolution is low, for which craftsmanship is not a priority. The economic cause is obvious. When money is tight, corners get cut. Result: An unprecedented number of no-time, no-budget “designs” swirl about us in unrelieved clutter. Work under such stress has inﬁltrated print, too. It has become normal. Web resolution will improve. The economy will improve, too, if this cycle is like the others. The clutter, however — the bazillion unrelated ﬂashy, blinky, in-your-face images that ﬂy at us from everywhere — the clutter is probably ours to keep. Which gets me to saving the world. How as designers do we make our messages seen and heard above the noise? We TALK LOUDER. Wetalkfaster. We wave—YoOHoO! Don’t outshout it; just get rid of it. Look again at the space above. Wherever you encounter Apple, it’s in a beautiful sea of white. No song, no dance. Just a message. It’s easy on the eyes, easy on the nerves, and easy to grasp. Best, it focuses on the product. The reason why is so simple. The product is the only thing there. The surprise is how hard simple is to do. Our tendency is to add stuff. If one thing is good, two must be better. Type seem plain? Add a shadow. One line blah? Draw two. This editorial was originally published in Before & After issue 32. What’s that old saying, if you want to get someone’s attention; whisper. You couldn’t be more spot on! Perfection then is finally achieved, not by when there is nothing more to add but when there is nothing left to take away. I like to reduce my words and images to their essence in pursuit of the holy simplicity you mention, seeking power in purity. But I often go too far, eliminating all complexity and in so doing leaving no dots for people to connect nor delights for them to discover. Instead of my hallowed simplicity, I achieve bare austerity. Recognizing this problem, I’ve started to look for examples of complex designs that are still clear and beautiful. As an homegrown example, in my living room I have a wall of black bookcases, filled with rows of books, interesting objects, and the odd picture. The effect is detailed, if not cluttered. Yet I get many compliments on it, even from minimalists. So simplify, definitely. Now if you’d turn your mind to a future DesignTalk on the opposite idea: how to add mystery and depth to involve the viewer. Wishing the best in 2014 to all. I laughed when I read this article … not at what you wrote … but at my reaction. 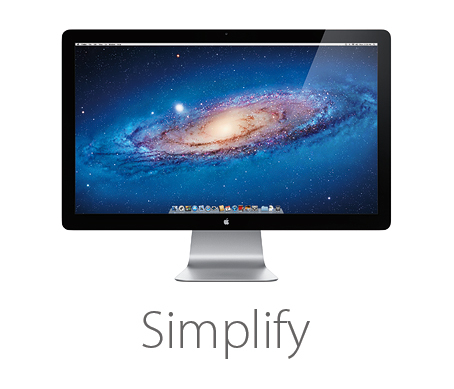 I saw the word “Simplify” and thought you were going to encourage us to use a photo from outer space that was a little less detailed and remind us to remove the row of icons from the bottom of the screen. Thank you for helping me see the world better … Merry Christmas! Agree completely. I regard this as the mantra in as many things as possible. Thank you for the great article. However, I wish that my clients understood this, too. It is not always easy working for clients who admire LOUD products. One of my biggest frustrations when working for a client is when they insist on adding more details to a beautifully simple design. I always think of Will Ferrell in the SNL “More Cowbell” skit. So, when my husband sees me frustrated after talking to a client, all I have to say is, “More cowbell” and he knows what’s happening in my project. How many clients actually like simplicity/white space? Absolutely none in my experience. They all want flyers, ads, etc. to look like Word documents: full of rubbish. I couldn’t agree more with you that simplicity is beautiful and speaks louder than fitting the Bible into the space of a postage stamp. In my dreams … ? When I first started in design nearly 20 years ago, I thought my design was complete when I could not throw anything else at it. Now, I feel like my design is complete when I can’t take anything else from it. Of course, convincing the client of this is probably the subject for a different Design Talk. Thank you for the encouragement I get every time I read your article. Simplicity in everything is simply the best just like you! Thank you John for being my guiding star!! I wish to learn more from you! Thank you, Patima! And happy new year to you, too! WOW! Well said! I’ve been trying to communicate to my students exactly WHY I love Apple and their products and design. When you purchase an Apple product the experience starts right from when you walk into the shop or visit their website. Clean. Simple. Beautiful. The unwrapping of the product from the packaging to the switching on for the first time. It’s an experience! Not like buying groceries. You feel like royalty. I love it. Thank you for this editorial piece!